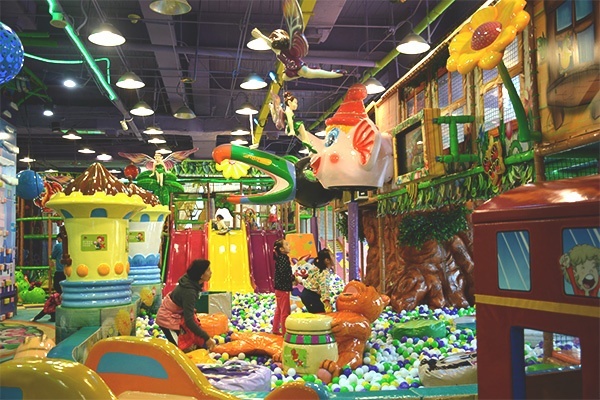 The foreign engineering naughty castle is jungle theme , so most of the devices are bright green, bright and attractive.In the picture, the product is given priority with naughty fort, does not contain baby district. Each product design are based on customer requirements, so even with the same theme of naughty fort, or are similar in appearance, but the inside the content can not be the same. The area of the naughty castle although is not very big, about 100-150 square appearance, but the internal area is very clear, in the picture we can see the entrance to a naughty castle and external image. 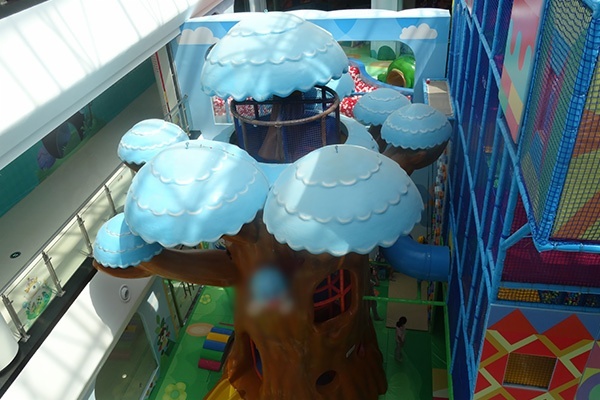 Before entering the naughty castle, the ground is very clean ceramic tile or marble ground, since the entrance into the naughty castle product and internal, the ground USES the EVA cushion matting, the protection of the soft ground in the face of the child is very good, to ensure the safety. All kinds of plants and animals at the entrance of adornment modelling lifelike, in addition to fit the theme, for children, also full of huge temptation. Up of the picture you can very clearly see the inflatable slide, and alongside it is naughty castle. The slide is in the jungle theme, the volume of the slide is very big, with other products within the naughty fort, into a variety of combinations. Lower left drawings is naughty fort the outside of the parents or the child rest area, when the children of parents or children playing tired, sat on the bench can continue to take a short rest. 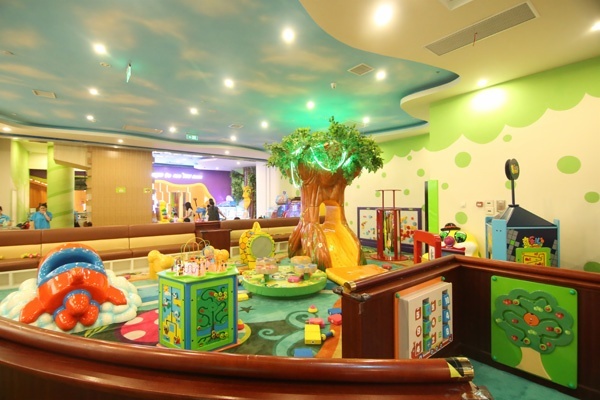 humanization about the professional design and production, it's our attitude of the amusement equipment, and on the basis of years of experience, it is convenient for the children at the same time, also makes it easier for parents, kill two birds with one stone. The lower right corner is a place to show the details of the amusement area, each print pattern on the surface of the pillars is very exquisite, the outer package of sponge also makes it more secure. 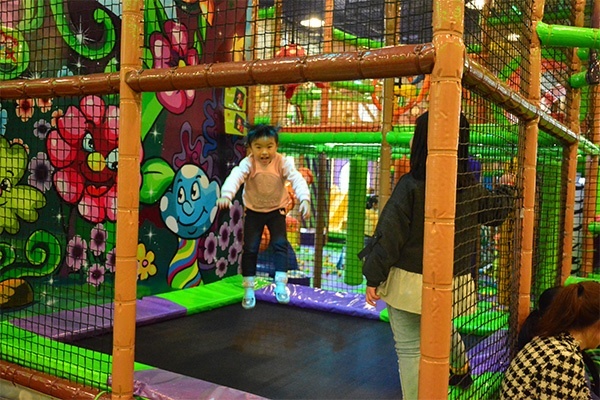 Fun ball-battle area is a normal part of the naughty castle, generally for two layer, bottom layer is mainly put a figure on the equipment, like upper air ball machine, suction ball machine and so on. Small ball machine are usually placed in the position of the second floor, divided into both sides, each side groups of cannon ball machine, the children near the cannon ball machine, opposite or arbitrary direction shoot, feel very stimulating. Every ball machine has different color, and the cannon balls are colorful, the colour of profusion more inspire children the love of the game, the soft sponge ball is made of green environmental protection material, fun and safe. This kind of game can train the children's physical coordination, and communication and cooperation ability, benefit for children's growth. 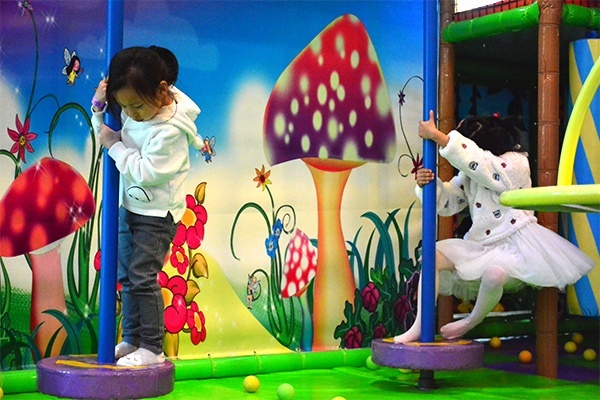 The three small picture is internal figure of naughty castle, such as pipe on the left side of the slide, in addition to the normal long slide, pipeline slide is also a popular children's favorite products, mainly because of the unique shape. When the children slide down from above, they will feel thrillful, because they do not know where they will go. And closed all around to get the kids to play more. Two some picture is on the right side of the ball pool, ball pool are always popular in a naughty castle, sink into a colorful ball pool is very wonderful, children can always find unlimited fun. The picture above shows the pipeline tunnel and all kinds of software educational building blocks toys. Pipeline tunnel has many shape, straight, bend, and pipe wall with transparent plastic window, lightful, the children crawling inside, will not feel afraid. Spread and educational toys to the children's imagination of thinking, promote the comprehensive development of the brain. 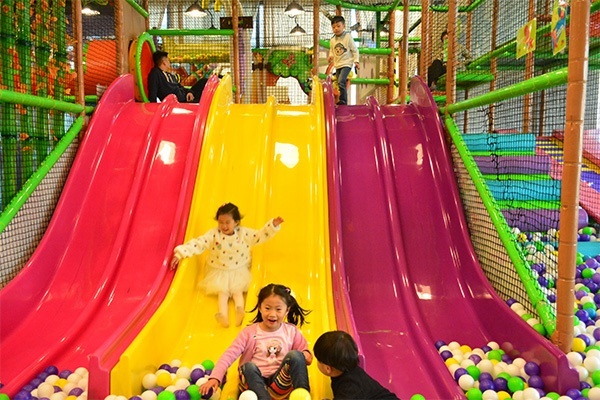 The lower left corner of the rainbow slide is very long, bright color make person's mood clear, long slide go straight from the top to the bottom of the naughty castle, children like this more exciting games. And this slide is designed according to the children, so the upper part is steep, sliding fast, yet the other half is flat, therefore it becomes quite gentle, and at the bottom of the EVA cushion can withstand the children very well, protecting the children form getting hurt. The lower right corner of adventure as same as the educational building blocks, it can exercise the children of courage and adventure, good in education. Three small picture above are part of the naughty castle internal educational building blocks toys, educational building blocks toys category is numerous, different modelling, such as animal model rocking horse, hang a wooden man with a pile, "CHEER AMUSEMENT" fun house, as well as Numbers and letters puzzle blocks, etc. Produced toys are hot this year, because it can not only bring children fun, but also can promote the development of children thinking ability, practical ability and the cooperation and communication ability, etc., letting the children know how to learn, a great effect on the growth of them later. 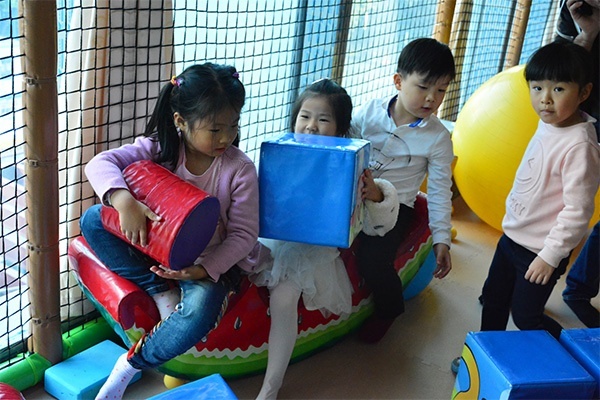 This kind of product are usually made by wood, coated sponge, the outer most print color leather sewing all kinds of patterns, in addition to attract children, it can let them learn consciously to play more, so many parents prefer to them. Birthday Room is another great area of the "CHEER AMUSEMENT" playground in recent year. If playground wants to make a festivals or parents want to take a birthday party for their children in the amusement park. This area is most suitable. 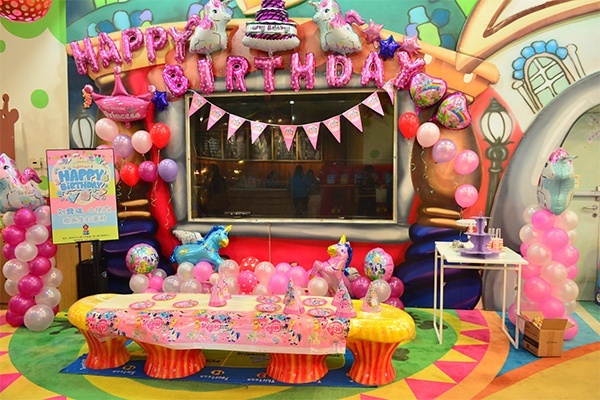 Hall interior decoration of colorful balloons, birthday hat, colorful lights, birthday gifts, and delicious food, coupled with the bless from their friends, there will must be a impressive memory to the children. Except for being a birthday hall, it also can be used as a manual area, the children can make their own gifts inside or other things, the feeling of a manul gift is much more precious than the boughten. Children like everything in this place. The region is generally outside of the naughty castle, mainly for parents and children taking a rest, elegant unique decoration, delicious food and drink, letting children and parents who have played exhausted have a break. If the child is old enough, parents can let your children play himself in the naughty castle, and they can have a good time here, for parents, here is very amusing!